The French Ambassador to Zimbabwe, Mr Richard Boidin has castigated the local private media for peddling falsehoods on the prevailing situation in Zimbabwe to the international world. Mr Bidin was speaking today when a French delegation paid a courtesy call on the Speaker of the National Assembly, Advocate Jacob Mudenda and the President of the Senate, Cde Edna Madzongwe. The delegation, which is also part of the Zimbabwe France Parliamentary Friendship Association, is in the country on an exchange visit expected to establish strong relations between the two countries. Responding to an appeal by Cde Madzongwe for France to lobby the European Union (EU) parliament to lift sanctions on Zimbabwe, Ambassador Boidin said the situation in Zimbabwe is wrongly perceived by the international world. Cde Madzongwe said the Zimbabwe French Friendship Association will help re-establish good relations between the two countries. Advocate Mudenda commended French companies which now amount to 30 for their investments in Zimbabwe in the areas of energy and wheat production, among other areas. 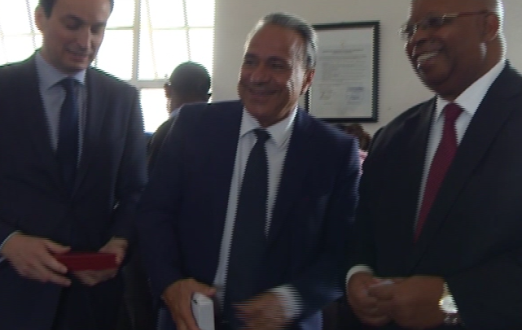 The French parliamentary delegation leader, Guillame Chevrollier said his country is open for cooperation and is keen to establish good relations with Zimbabwe. Zimbabwe France Parliamentary Friendship Association – Zimbabwe Chapter Chairperson, Honourable Wonder Mashange said bilateral relations between the two countries, which started in 2015 on the sidelines of the United Nations Climate Change convention (Cop21) in France, are destined to reach greater heights. As part of the bilateral relationship, a number of Zimbabwean ministries such as agriculture, environment and tourism have for the past year visited the European country for economic engagements.